SPECIALIZED CAPABILITIES: Your business or organization has unique needs, and Sage 50 Quantum provides industry-specific capabilities for management and reporting in construction, manufacturing, distribution, and non-profit categories. WORKFLOW AUTOMATION: Sage 50 Quantum Accounting tracks the details in your company's sales and purchasing, so nothing slips through the cracks. Ensure everyone stays informed with automated routing of critical activities to the right person. MORE USERS: Sage 50 Quantum Accounting accommodates up to 40 named users, available in packages of 1-5 individual licenses, or larger packs. Role-based security allows you to assign specific roles to limit access to data and functional areas. EASY INTEGRATION: Sage 50 Quantum Accounting Software 2019 integrates seamlessly with Microsoft Productivity Tools, including Word and Excel so you can import and export crucial data with a familiar and easy-to-master interface. Take your accounting performance to the next level with Sage 50 Quantum Accounting. It’s everything you love about your current Sage Accounting Software, customized to the needs of your growing business or non-profit. With the same interface you use now, you can obtain the increased capacity you need for users and data without having to learn an entirely new program. Focus on the details you need with a completely customizable dashboard and personalized navigation. 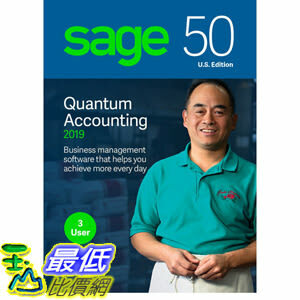 Sage 50 Quantum Accounting accommodates up to 40 named users, available in packages of 1-10 individual licenses, and 15, 20, 30, or 40 licenses. Role-based security allows you to assign specific roles to each user to limit access to data and functional areas required for that job. We’ve accommodated growth of your data, too. If your current database is at or near 250,000KB (250MB), Sage 50 Quantum Accounting can save you valuable time on reports or transactions. It allows you to save transactions 90% faster, access reports in less than a second and get more work done – faster. Save even more time with automated routing of critical activities to the right person at the right time. Sage 50 Quantum is easier to use and takes advantage of the business software you already use. Simply import your contacts from Outlook and then easily export detailed reports into PowerPoint or Word or import spreadsheets. Your business or organization has unique needs. Sage 50 Quantum Accounting features industry-specific capabilities in construction, manufacturing, distribution, and nonprofit that allow to manage and analyze your finances, inventory, and projects with increased detail. Take advantage of advanced reporting and analysis with complete access to Sage 50 Intelligence Reporting access and the ability to automatically update reports with real-time data pulled from Sage 50 Quantum. Plus, superior customer support means that you can receive quick answers to any question.